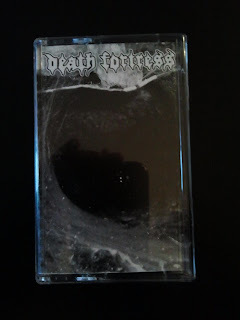 Death Fortress is probably one of the freshest faces I've reviewed on this blog to date. 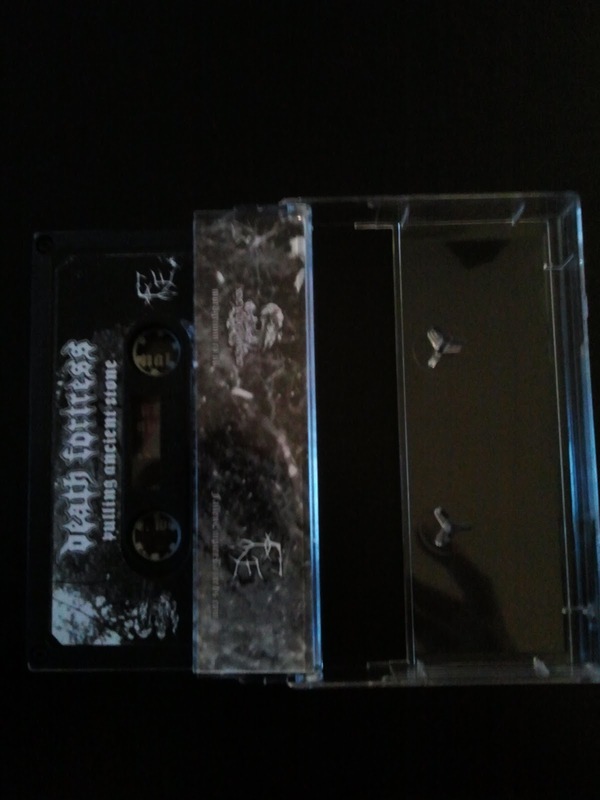 Virtually unknown to me (and likely the black metal community as a whole) until the past month or so, this band has already made quite an impact on me personally, and will hopefully do the same for you as my readers. 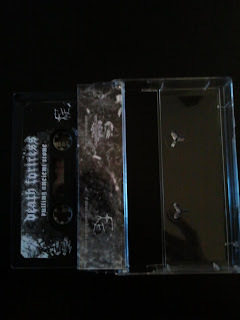 Everything about this tape screams raw and primitive. The packaging, songwriting, and even production values give this cassette the feeling that Death Fortress are channeling something ancient and ugly. Opening track "Eternal Enemies" is a barrage of blastbeats, guitars that stay primarily on the lower end yet retain the evil black metal atmosphere, and vocals that sound more akin to a cave dwelling beast than any modern man. The filth and fury here are thick and have made an instant fan of me. As soon as the song feels like it may build up to an overwhelming degree, it slows down just enough to make the second half of the song feel twice as furious. I feel like this band could play with equal success to a crowd of black metal elitists with folded arms as they could to old school death metal purists looking for a good opportunity to beat the living hell out of each other. If the ferocity of the first song wasn't enough, the title track follows with equally venomous intent. The drumming is a little easier to decipher through this song's particular fuzz, and I must say that it's quite impressive for this genre. Black metal bands don't often take care to keep the lower frequencies interesting, so it's nice to hear some truly masterful performance on the drums. A few minutes in, the song slows down into one of the most evil mid-paced riffs I've heard in a long time. I'm not counting minutes because I'm too busy enjoying this, but I seriously wish it could go on forever. While it doesn't last long, it provides the perfect breather and balance to the sheer violence it leads up to. These two songs end as suddenly as they began, leaving me with a desire for more ugliness, but I imagine there will be more to come from this bold new group. If you're interested in some aggressive new sounds, you can preview this album on bandcamp. As a warning to my readers, when I listened to this from my laptop on , it really didn't do the intensity of this cassette justice. The lo-fi aesthetics that sound great through a high quality sound system can sound rather flat and unimpressive from a computer. As with many other albums, I highly urge you to grab a copy for yourself so you can listen to it in the proper format.